The German- Japanese artist Jun Schäffer locates himself close to the art of conception. Sometimes he also uses a „objet trouvé“. His poetical and graceful installation of media are going to reveal a deeper sense if you let them in and take your time with it. He studied Japanese theatre in Tokyo and film, television and media arts in Cologne. His history is based on themes which we do not recognize in the first place – or do not want to recognize? 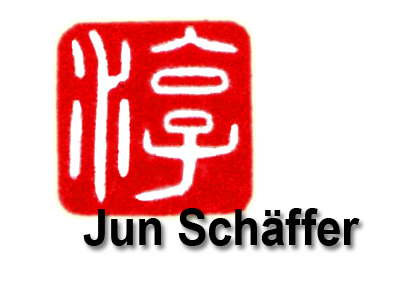 Jun Schäffer was born in 1964, he grew up in Cologne and Tokyo. He studied Japanese theatre at the Sophia University in Tokyo. Film, television and media arts he studied at the Academy of Media Arts in Cologne. Since 1996 he works as a free artist and director. Close to the concept art, the media installations of Schäffer is based on an idea, a concept, that is at least equal to it’s artistic execution. For this he occasionally makes use of an “objet trouvé”. He intensely devotes himself to his topics, explores any depth, considers from every angle. For reaching his final state of art, he collects the fitting notes and materials, sometimes even huge amounts, only to then delete it all again. Only the crystallized essence of his work stays. Solely the concentration on the crucial parts remains. At first, the objects’ aesthetic look appears to turn them slightly poetic – pines, softly waving in the wind, the wide ocean, the tender fall of a cherry blossom leave. A deeper look into the history behind the art will leave you touched by the story it tells. There are stories where we do not want to look, think, or even listen. You must take some time, show patience, and listen for a while. As shown in “mare”. Upon always the same sight of a seemingly idyllic blue sea, the soundtrack tells all else, to understand. One might then understand, whence the vintage golden frame is really made out of. The golden surfaces, that partly cover the pines, link to the fog patches. These fog patches are often used in Japanese culture, to either connect or cloak different scenes in the story. 1999 Drehbuch und Regie bei dem Kurzfilm „Moll“ (mit Nina Petri, Paul Faßnacht, u.a.) gefördert durch das Filmbüro NW e.V.